American Jezebel. Now that was an intriguing title. I was looking for another book to download to my iPad for our road trip. The title certainly caught my attention. What American woman could ever have earned that title? Maybe some background information will help put this into perspective. Jezebel was a really, really bad girl in the Old Testament. Where Eve gets blamed for all sorts of ills this side of eternity, Jezebel did all sorts of bad things, besides provoking the heck out of God’s man on the ground, Elijah. Jezebel was a Phoenician princess who married Israel’s Northern Kingdom King Ahab, most likely to form a political alliance between Israel and the Phoenicians. The old Testament books of I and II Kings tell the intense religious-political story of the Northern Kingdom, which is quite detailed. Jezebel was sophisticated, cosmopolitan, and the real power behind the throne…which she used to her advantage. She was not at all interested in the Hebrew’s God and was a constant thorn in the prophet Elijah’s side. In fact, he was pretty terrified of her even though he won out in the long run. She also met a really grizzly death, especially noted for the fact that not much of her was left after the dogs finished with her! Who could this American Jezebel be? This woman was called an enemy of the state, this impudent Puritan, not fit for our society, a dangerous instrument of the devil, and this American Jezebel, among other things. She’s also the reason Harvard College was started, and thankfully because of her trial, it is the only written record of any woman from that era in American history! 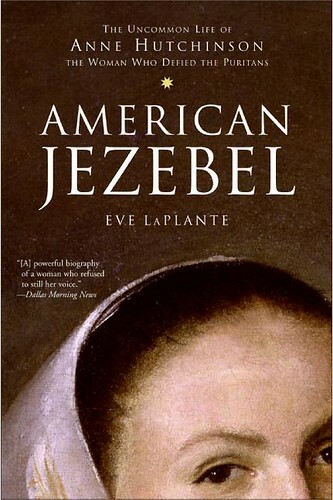 American Jezebel: The Uncommon Life of Anne Hutchinson, the Woman Who Defied the Puritans is written by the eleventh-generation granddaughter of Anne Hutchinson, Eve LaPlante. I’m a confessed theology geek and there are theological nuances that form some of the debate between Anne Hutchinson and her male accusers. LaPlante clearly navigates the theological debate, salvation by works or salvation by inward grace, that was the basis for the heresy trial, making them understandable for today’s reader. The irony of her trial was that the very leaders who fled England because of religious persecution, were now persecuting one of their own! There were other clergy who were censured and banished from the Massachusetts Bay Colony, but Anne Hutchinson posed a severe threat because as a woman she was challenging the civil and religious elite. At the close of her civil trial (another church trial ensued! ), the Massachusetts court determined to build the first college, taught by orthodox ministers to indoctrinate young men before they began to think for themselves. Anne Hutchinson’s heresy trial took place in 1637. The First and Fourteenth Amendments, protecting our religious liberties and freedoms, are a direct correlation of the struggles in the colonies more than one hundred years before the Revolutionary War. Sadly, “heresy” accusations still exist within the church. Christian religious lines are still being drawn and subtle and not-so-subtle forms of persecution still occur. Today, some are purposely blurring the lines between civil and religious issues. American Jezebel is a more-than-worthwhile read for those who want to understand the historical struggles and sacrifices paid by our forebears because religious freedom is a precious right we would do well to guard.